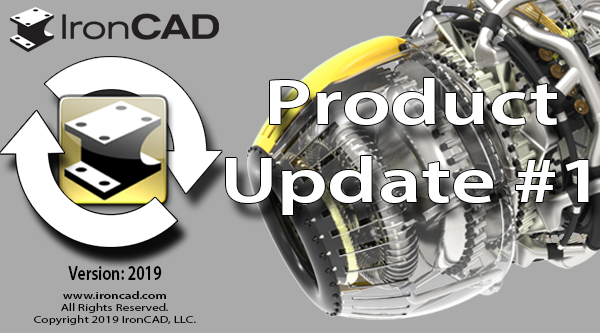 We’re excited to announce our latest release, IronCAD 2019 Product Update #1. 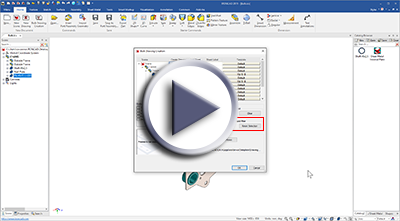 This update extends powerful functionality and ease-of-use improvements added in 2019 in addition to many usability improvements to increase design productivity in your design process. Listed below are more specific details about the productivity enhancements for 2019 Product Update #1. 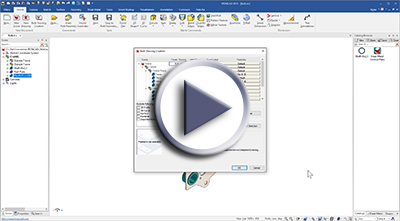 New to IronCAD 2019 Product Update #1 is an Interactive Start-up Tutorial designed to give users an overview of the IronCAD interface as well as provide an interactive example of how to use IronCAD’s key functionalities, such as the IntelliShape sizing handles, TriBall positioning and orientation utility, Catalogs, IronCAD Mechanical utilities, and the Bulk View Drawing Creation. 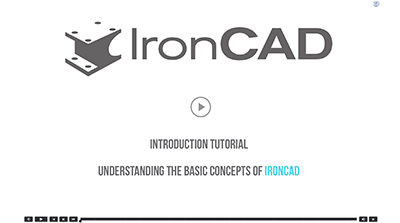 Simply start IronCAD and run the tutorial at your own pace to learn key concepts for using these unique CAD design capabilities. IronCAD 2019 adds a new toggle handle to IntelliShapes to allow the push-and-pull handles to change from single direction to symmetrical direction movement. 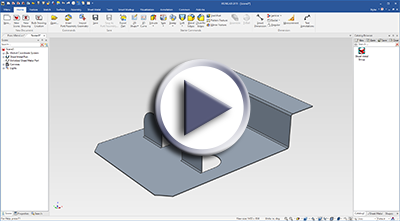 Additional enhancements now allow this toggle to be saved within the IronCAD design memory and stored with the IntelliShape. This permits you to create your own custom features with desired handle movements that can be stored in catalogs for future reuse. 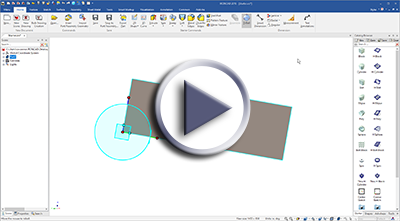 The new behavior in 2019 to automatically toggle to other IntelliShape handles during edit has been improved to allow user-defined control on the tab order. You now have the ability to set which handles are available for the toggle and which order the handles will toggle. This give you the precise behavior control for your shapes during handle input. 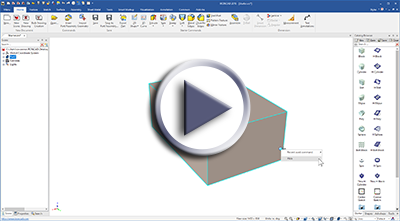 For improved visibility control, IntelliShape sizebox handles can now be toggled on/off by left-clicking. 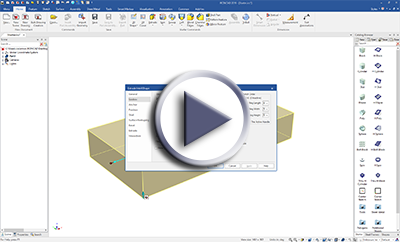 In some cases, IntelliShape handles may overlap with information you wish to access. With these new options, you can quickly deactivate a handle to alleviate any object visibility issues. 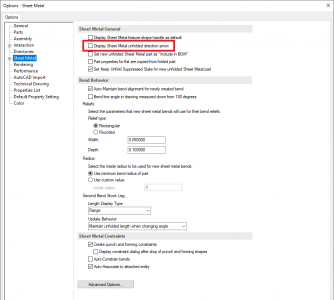 Enable/Disable View Rotations – A new option has been added to enable/disable the outer-ring view orientation rotation. Useful for graphical and visual orientation control. For users who desire precise rotations about an axis, this rotation view may now be disabled, and by default, will remain in the “Off” position. Disable of UI Elements when TriBall Active – To improve clarity during TriBall use, new behaviors have been added to automatically hide elements such as sketch dimensions, TriBall Activator, and IntelliShape handles. These new behaviors improve visibility, particularly during multi-shape selection of IntelliShape features. 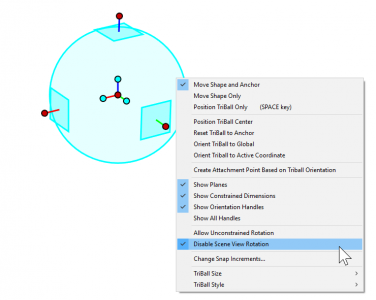 Access to Axis Handle in Orthogonal Look-At Views – In 2019, IronCAD users were granted TriBall control and access to the centerpoint handle while in simultaneous view mode along the TriBall axis. Users in this view were excluded, however, from selecting the outer axis handle for rotation. The newest resolution? All users may now select the outer TriBall ring, lock, and drag to rotate as they see fit. Hide TriBall Activator Handle – The TriBall activator tool (which appears on selected objects) can now be hidden. To temporarily hide the handle for better visibility to objects behind the activator, simply right-click on the icon. In the Tools/Options/Interaction, users can hide the activator permanently, if desired. Improvements have been made for older files to load using the older style edge display instead of automatically switching to the new Bold Edge display. In addition, a new Edge Display toggle in the status bar has been added to support Shaded Edges with Bold Style. Facilitating usability and access to files, IronCAD’s Open Dialog now support native files (with the purchased Native Translator add-on) as well as imported file formats. 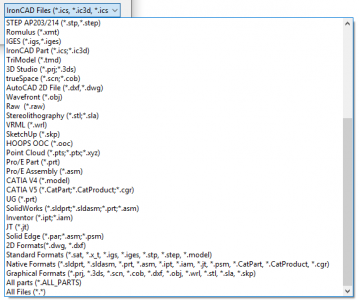 Users may now quickly and openly access any supported file type to load/import into the IronCAD scene environment. 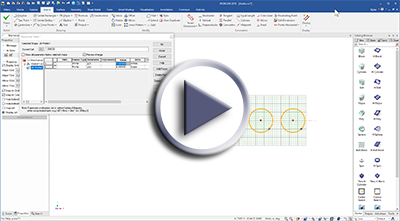 The 2D Sketch Pattern Tool has been enhanced to add both the pattern dimension and the pattern number automatically to the the parameter table. 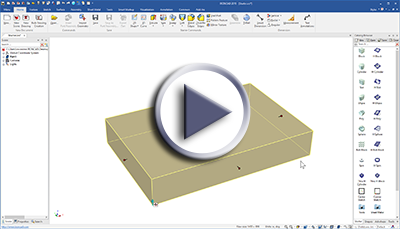 This new feature allows full user control to modify the pattern within your parametric design using the parameter table. 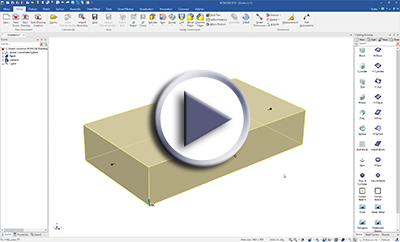 When placing constraints to SmartDimension in the 2D Sketch, a new dialog box will appear to allow input and assigning of the parameter name and dimension value. This reduces the need to edit the parameter name later in the parameter table. In addition, the dialog box now supports numeric and formula input during the dimension creation. New usability improvements have been made to the Shrinkwrap command to make it clear when loading full and simplified versions of files. 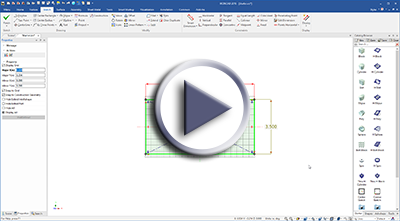 Support has been added to assemblies to support user-defined front-view definitions for the orientation when creating drawings, which proves extremely useful when using the Bulk View Creation tools that lay out views based on their orientation. 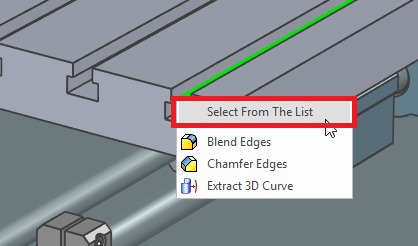 The “Select Other” tool is now accessible using a right-click menu. When selecting to a Face/Vertex/Edge, you can now right-click and access the selection filter to reveal another Face/Vertex/Edge in the depth direction of the cursor location. The Open/Import dialogs in IronCAD have been updated to use the latest dialog boxes from Microsoft, providing quick access to favorite folders and navigation consistent with Windows Explorer. IronCAD’s graphic engine has been updated to support the latest improvements. 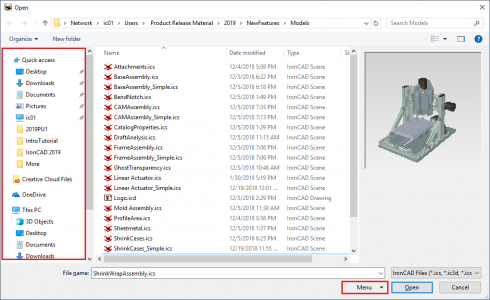 IronCAD’s Translators have also been updated with the latest release of the IronCAD DCS, and users will have access to the following versions of CAD file formats using our Native Translators. 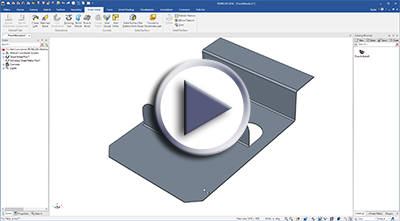 A new feature for Sheet Metal has been added to support custom punch bends. 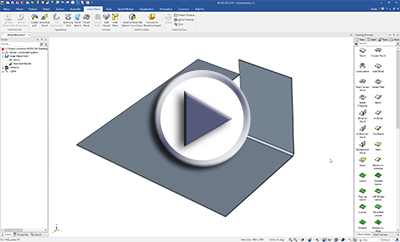 Using a 2D Sketch, users can design the cut-out and the bend-line for the operation. The punch bend can be set as a laser cut shape or it can have a user-defined cut thickness. Once created, users can store their own punch bends within the catalogs for reuse in future designs. 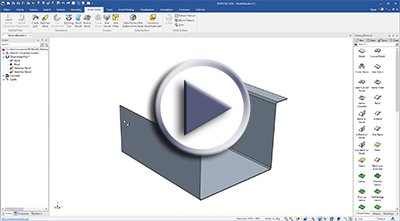 Reuse of Sheet Metal designs in other projects is now easier with the ability to store both the folded and unfolded Sheet Metal together in catalogs. Select both the folded and unfolded parts in the scene browser and simply drag and drop into a catalog. Now you can drop into a new scene and both components are added. Once the unfold operation is performed in the new file, the two parts are connected. New controls have been added in the standard Sheet Metal and sketched bend Sheet Metal to set offset values for the unfolded bend-lines. In some manufacturing processes, this ability is useful to identify the bend-line start location, within examples such as corrugated packaging, using a crease tool. Users now have direct access to sketch bends and the ability to edit sketch positions within the sketch bend framework. When selecting the sketched bend, the sketch will now appear, and re-positioning handles for sketch line locations will also remain available within the 3D scene apart from sketch mode. 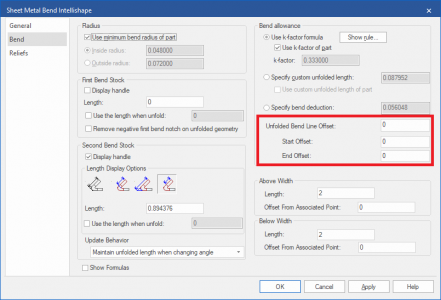 A new option has been added to restrict the bend-line location to the length of the sketch line versus extending through the full stock length. This is useful when you have a small bend segment (like a U) where you only want to bend one side using the sketch bend. The viewing direction for the Sheet Metal is controlled via an arrow on the Sheet Metal part. This toggle control is now invisible/hidden by default to avoid inadvertent clicking which can change the orientation and up/down directions in drawings. 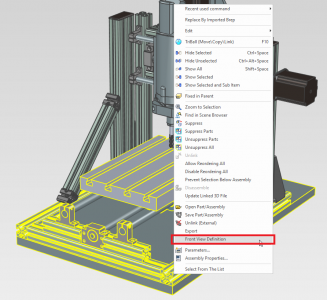 To enable, select the option in the Tools/Options page for Sheet Metal. You can now create drawings using the Bulk View Creation tool and open other drawing files to update them. For example: You can create a drawing for a set of parts. Then you can create a new drawing for a set of assemblies. The Bulk View Creation allows the ability to double-click on the existing drawing file to load or create a new drawing. 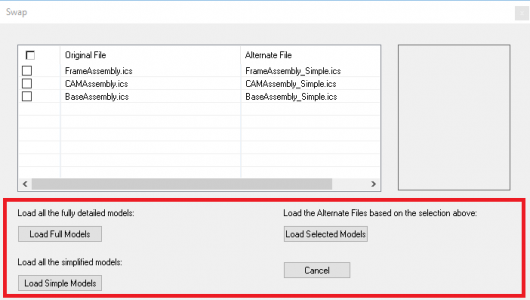 A new option has been added to select only the parts/assemblies currently specified within the scene. 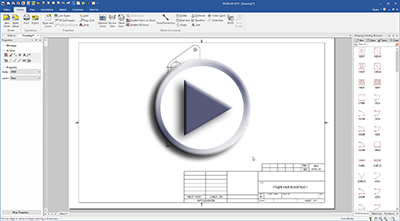 This new capability is useful when users wish to add additional sheets to prior drawings for newly created components. The SmartDimension tool is now more “snap-intelligent” than ever. For example: If you are creating a dimension and snap to an existing dimension that doesn’t overlap the extension lines, the dimensions will align. If the extension lines overlap, it will snap in a baseline type function to provide offset distances between the dimensions. The drawing performance now has new upgrades, which includes increased camera pan/zoom interactions when drawings contain many text annotations. Additional zoom improvements have been made for areas of a drawing where clipping is performed on non-relevant data.